When the Life is Beautiful Music and Art Festival debuted in 2013, the home grown music festival catered mostly to residents in local and surrounding areas. Since that inaugural event six years ago, the three-day festival in September 2018 attracted 180,000 visitors from all 50 states and 24 countries to the roughly 18-block radius. Factor in that the City of Las Vegas also played host to the iHeart Radio Music Festival and a Presidential visit that week, and it is a testament to the months of advance planning and coordination by city planners and public safety officials alike to keep multiple large events running smoothly and without major incidents. In addition to the usual site prep and emergency operations plans, the City of Las Vegas shouldered the added complication of ensuring emergency communications for the hundreds of local, state and federal public officials who descended on the area that week. For Craig Cooper, Special Operations Chief for the City of Las Vegas Fire and Rescue, the chance to participate in a FirstNet demonstration to bolster emergency communication for area first responders was too good to pass up. Now available to first responders nationwide, FirstNet is the nation’s first wireless broadband network dedicated to public safety communications. FirstNet is being built with AT&T, in public-private partnership with the First Responder Network Authority (FirstNet Authority) and offers first responders an “always on” connection for emergencies or day-to-day operations. For the demonstration, AT&T’s FirstNet team distributed 30 FirstNet Ready™ mobile devices to local first responders from the Las Vegas Fire and Rescue team, including firefighters, EMS, and bomb squad personnel. After a brief training session, they gained access to an application for push-to-talk capabilities and multidiscipline talk groups to enhance communication between their team and other area first responders. “What we are really excited about is that we can use this chat group to have a one-on-one conversation with specific groups to get and relay the information and coordinate with each other,” said Cooper about FirstNet. Communicating over FirstNet also gave Cooper and his team access to preemption – a feature that enables first responders to communicate and coordinate during emergencies, large events or day-to-day operations when networks typically become congested. 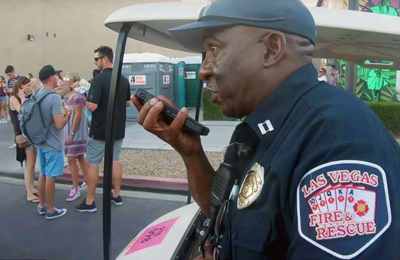 During the festival, FirstNet allowed the City of Las Vegas Fire and Rescue to cut through the cellphone traffic and provided prioritized access to the network to meet their critical needs. That means voice, text, videos, and location-based information was made accessible and without delay over FirstNet – all the information they need to protect the public and stay safe. After the demo, Cooper, his staff and the other local public safety agencies had access to an on-the-ground First Responder Advocacy team to discuss and give feedback on the FirstNet network and the day’s events. Learning about public safety’s experience while communicating over FirstNet remains an important component of building out and improving upon the network. As the network is further built out, the FirstNet Authority will continue to engage with public safety in the states, territories, federal and tribal agencies to ensure that FirstNet meets their needs and incorporates their feedback.